we configure FrontMan to log any csc.exe calls in the system, including ASP.NET compilations. Fortunately you don’t need to manually edit the registry. Running FrontMan -install csc.exe from the elevated command prompt will create the needed keys for you. 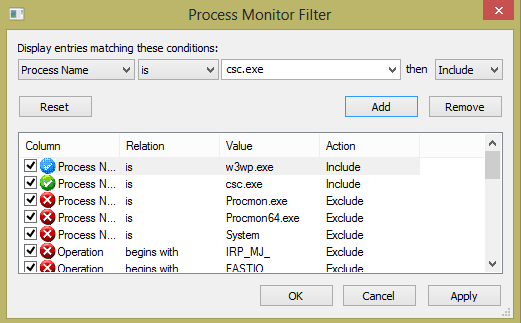 On the contrary, running FrontMan -uninstall csc.exe will remove them from the registry. /t:library /utf8output /R:"\\dev-server\dev2\appname\bin\EmailSystem.Contracts.dll" /R:"\\dev-server\dev2\appname\bin\EmailSystem.Client.dll" /R:"System.dll" /R:"System.Core.dll" /R:"System.Web.Extensions.dll" /R:"Microsoft.CSharp.dll" /R:"ev-server/dev2/appname/bin/EmailSystem.Client.DLL" /out:"C:\WINDOWS\TEMP\pbjs1i2y.dll" /debug- /optimize+  "C:\WINDOWS\TEMP\pbjs1i2y.0.cs"
One of the EmailSystem.Client.dll references seemed to be broken and unnecessary. After seeing this command line I easily found a place in code where the compiler was incorrectly called. Thanks a lot Marek 🙂 I hope you are coming on Thursday’s WG.NET.